When it comes to your menu, one of the biggest trends right now is to get your guests involved in the process. Interactive food stations allow your guests to customize their fare to fit their preferences, making it all but guaranteed that your guests will be raving about the food at your wedding. From breakfast-themed bars to appetizer stations to dessert buffets, here are some of our favorite ideas. 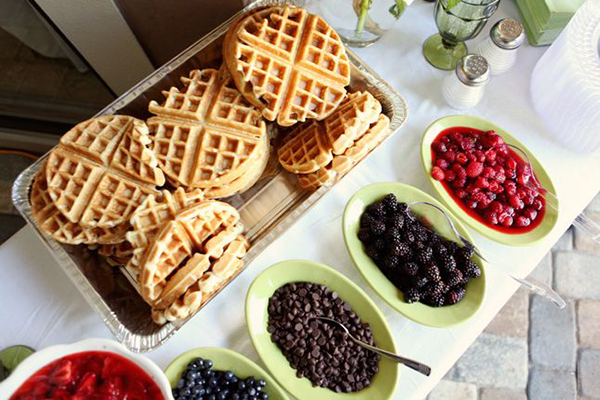 Waffles aren’t just for breakfast! With deliciously sweet toppings to choose from, this is sure to be a crowd-pleaser. A sandwich just tastes better on a flaky, buttery biscuit. Fill your buffet with various protein options, like fried chicken, smoked salmon, and eggs, with plenty of toppings like cheese, fruit butters, and spreads. Josh Tart, director of catering at Kimpton RiverPlace Hotel, also displays pre-made sandwiches for inspiration and for those who don’t want to build their own. Who doesn’t love bagels? Perfect for a brunch wedding, serve up a variety of bagels with sweet, savory, and traditional cream cheese spreads. Crepes are as versatile as they are delicious. Fill your crepe station with sweet or savory options that’ll please any guest’s palette. Give your appetizer bar a healthier spin with “avocado sundaes” – avocado halves topped with salsa, limes, bacon crumbles, fried onions, and dressing options like Ranch, Italian, and honey mustard. Can't picture your guests chowing down on half an avocado? Try the more mainstream version — guacamole. Andrea Correale of Elegant Affairs adds gourmet toppings like grilled pineapple, crispy slab bacon, mango, lump crab, and smoked pulled chicken to her guac bars. Surround an overflowing basket of tortilla chips with toppings like salsa, guacamole, corn, refried beans, and nacho cheese. Whether you prefer sweet or savory, make your own flavored popcorn with shakers featuring options like grated cheese, cinnamon sugar, garlic, chocolate, buffalo wing, and more. Make it even more delectable with candy mix-ins. Pretzels with dipping sauces – like mustard, nacho cheese, and caramel – are sure to delight your guests. It's also super easy to create an eye-catching display; event planner Oak & Honey Events created this simple display with plywood, copper pipes, and metal hooks. Baked, mashed, or fried? You don’t have to choose at this potato bar, where you can mix a variety of potatoes and toppings for your own creation. D’Amico Catering designed this fry station, where guests can choose from traditional fries, sweet potato fries, and waffle fries, then top with favorite mix-ins – like scallions, caramelized onion, sour cream, blue cheese, even cheese curds to create your own poutine. A carving station has been a wedding staple for decades; modernize it with a variety of fix-ins next to the meat for guests to personalize their dish. These Korean rice bowls are the ultimate comfort food; let your guests personalize their dishes with what they crave. Skip the box mix and make your macaroni & cheese wedding-appropriate with a homemade version featuring various mix-ins, like bacon and soft cheese. During the cocktail hour, utensil-free dishes reign supreme. Meat on a stick with an array of dipping sauces is sure to satisfy your guests. Give your chicken skewers an spicy twist with Indian flavors. Suspending the meat bowl from the ceiling makes it a treat for the eyes as well. Customize your noodle of choice with a mixture of add-ins, like vegetables, meats, cheeses, and sauces. Pay homage to your hometown with a food station featuring local fare, like this Philly cheesesteak bar. Include a sign on how to order like a local. Photo Credit: OneLove Photography via Jay’s Catering Co.
Add to the guest experience with a mobile bar, where guests can skip the long lines and get a fresh drink made for them as they continue to mix and mingle. Create an Italian soda bar with club soda, fruit-flavored syrups, and whipped cream. Guests of all ages will love personalizing their beverages. Make your dessert hour even sweeter with a hot cocoa bar, filled with delicious mix-ins for your chocolatey treat. Combine fresh juices, cut-up fruit, and sparkling wine for a mimosa bar your guests will love. Blend sweet and savory morsels for a one-of-a-kind trail mix. Recall happy childhood memories with a snow cone machine, featuring an assortment of flavor options your guests can mix and match. Another fun choice that’ll delight guests of all ages is a cotton candy station. It’s easy for guests to make their own, and you can infuse a variety of flavored sugars. Give your dessert bar a healthy twist with acai bowls, which guests can top with delicious fruit, seeds, and nuts. Make your own ice cream sundaes! Waffle bowls, sweet sauces, and crunchy toppings will delight guests of all ages. Personalize doughnuts with various dippers and toppings. Take the classic s’mores dessert up a notch by including flavored marshmallows, white, milk, and dark chocolate, and even multiple flavors of graham crackers. Get the taste without the mess with s’mores on a stick, created by 240sweet Artisan Foodworks Catering. After toasting a flavored marshmallow, guests can roll the sweet treat in a variety of toppings, like graham cracker crumbs or chopped nuts. Capitalize on the edible cookie dough trend with a build-your-own buffet, where guests can create their own custom flavors from a variety of mix-ins. "Cookie dough bars have taken the place of ice cream sundae bars," says Andrea Correale of Elegant Affairs. "Kids and adults love it."